You are viewing the archived 2014 ratings for lawn mowers. Go to the current lawn mowers ratings. 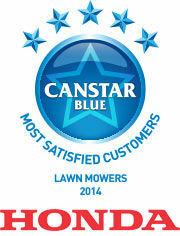 More than a third of Australians who responded to our Canstar Blue survey genuinely love mowing the lawn but, bizarrely, they are unwilling to admit it to their partner. Additionally, more than two in five consider themselves an expert at mowing! Given the affinity most Aussies seem to have for their front lawns, we’re sure you’ll be interested in our latest ratings of mower brands. Customers who had purchased a lawn mower* in the last three years reviewed their purchase, and from their responses we determined these ratings. For 2014, Honda was the mother of all mowers; the mulcher with the most-est; the clipper of grass that shone like glass. Ahead of Rover, Masport and Victa, Honda achieved our Most Satisfied Customers Award – Lawn Mowers, 2014. It’s been three years since we last rated lawn mowers, but Honda continues to win over customers just like it did in 2011. So, what does each lawn mower brand have to offer Australian customers? You’re about to find out. * Petrol models only for these results. Honda is probably the most well-known brand on the list, thanks in no small part to the fact that it’s been producing automobiles and motorcycles for decades. However, its vast array of domestic and commercial equipment clearly shows this brand is no-one trick pony. While the company did share several top ratings in these results, Honda was the only one to secure five stars in all our criteria. That covers overall satisfaction, value for money, reliability and performance, the ease with which the motor can be started, servicing, quality of the mowed lawn and after-sales service / warranty. Honda has three domestic lawn mower products? on its website: the HRE370 (an electric motor-powered, compact model), the HRU19K1 (a four-stroke petrol model) and the HRU19M1 (similar to the K1, except it includes technology to mulch while you mow). In conjunction with its ride-on, cylinder and standalone mower products, Masport also produces line trimmers (i.e. whipper snippers), blowers, hedge trimmers, shredders and more. In short, it is a true outdoor equipment heavyweight and it’s therefore unsurprising that it received five-star ratings for the quality of the cut grass and its lawn mower reliability and performance. The company also received four stars for overall satisfaction, value for money, ease of starting, maintenance / servicing and after-sales service. Masport produces several different lawn mower models: the President series, the Silver Series and some generic offerings (e.g. several models for Bunnings Warehouse). Many of its models support “cut, catch and mulch” technology, and are buoyed by either steel or alloy frames. Rover does a fantastic job of producing various lawn mower products for varying budgets and needs. Higher end models have mulch catchers, alloy decks and key-start motors; less expensive models are powered by a 123cc engine and can churn through a full acre of grass. Rover received five stars for the reliability and performance of its lawn mowers. The company received four stars for overall satisfaction, value for money, maintenance, quality of cut grass and after-sales service; and three stars for the ease with which its mowers could be started. Rover mowers have a consumer warranty on engines of up to five years, and two years’ consumer warranty on the unit itself. The company has 13 different lawn mower products, all petrol powered. Victa is so iconic in terms of representing the idyllic Australian lawn mower that it actually featured in the 2000 Sydney Olympic Games opening ceremony. The brand – an Australian institution for more than 55 years – is reportedly all about “lawncare”, which has put it in good stead in our results. Victa received a five-star rating for value for money and four stars for overall satisfaction, reliability, maintenance / servicing, grass cut quality and after-sales service. It also received three stars for ease of starting. Victa has 41 different petrol lawn mowers available, all with utterly heroic-sounding names (in this author’s opinion) like “Commando”, “Hawk”, “Bronco” and (our favourite) the “Mustang”. These products have all the standard features of a modern lawn mower, come in a variety of engine types (i.e. two- and four-stroke) and showcase varying power outputs for differing consumer needs. If none of the above interest you, Victa also sells a battery-powered model as well as two electric mowers. Canstar Blue commissions Colmar Brunton to regularly survey 2,500 Australian consumers across a range of categories to measure and track customer satisfaction. The outcomes reported are the results from customers within the survey group who have purchased a petrol lawn mower in the last three years – in this case, 547 customers.